In 1921, John Marchbank, a wealthy gambling hall owner, purchased the Sulphur Springs Ranch (originally owned by Ygnacio Sibrian). Marchbank converted the ranch into a thoroughbred training facility that was to become the most important horse-breeding farm west of the Mississippi, raising dozens of champions. He named his ranch Heather Farm after his champion stallion, Heather King. The Spanish-style mansion he built still stands as the St. John Vianney Catholic Church rectory. The City acquired 50 acres of the farm and combined it with 5 adjoining acres donated by Phil and Ruth Bancroft to create Heather Farm Park. In 1931, film actor Clark Gable filmed scenes for the MGM feature movie Sporting Blood at Heather Farm. 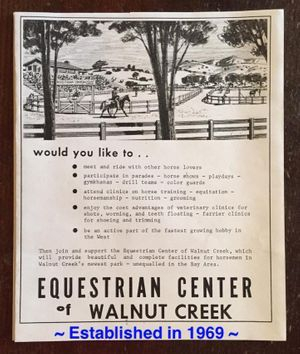 The Equestrian Center of Walnut Creek was built in 1970 due to the foresight and efforts of a group of local equestrians. James Naviaux, DVM, thought it was a good idea to conduct a course in horse husbandry for interested people in the Walnut Creek area. The overwhelming popularity of the class awakened residents to the need for more facilities for local equestrians. In 1969, there were nine clubs and 130 members in the ECWC. T. W. "Cap" Carrithers was President of the California State Horsemen’s Association in 1967-68 and the first President of the fledgling ECWC organization. Through fundraising and many volunteer work parties, the ECWC was built. 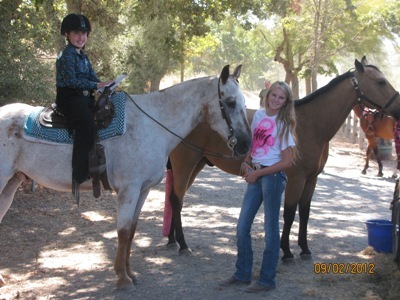 We are very proud to still have the ECWC to use for our local Equestrian events.